Several week ago, I saw on Twitter that Blake Mycoskie was doing a book give away, I popped over to the Start Something That Matters site and entered to win Blake Mycoskie’s new book. I wrote a couple short paragraphs about why my blog or twitter would be a great platform for me to receive two copies of Blake’s books, read one, review it, then give away the second with a contest of my own creation. I found out a couple weeks later that I was one of several people picked! (which is awesome, cause I am fairly certain my sister is actually the lucky one in my family) Once I received the books, I began reading every night before bed, which is typically my nightly pattern with whatever book (or books) that happen to be on my nightstand. Last night I finished the book, and while I am giving a bit away by not holding you in suspense, I absolutely loved it… Now on to the review; I have been thinking for the last week or so as I neared the end of the book about how I wanted to review it… I came up with all sorts of extravagant ideas, lame ideas, and probably really boring ideas, but I finally settled on breaking the review into two parts. The first part will actually be my review and thoughts of the book, the second part will be the way the book has inspired me to start my own something that matters. Start Something That Matters is a very easy read, it has the feel of sitting down with a friend over a great cup of coffee and listening to him excitedly and passionately tell the story of how TOMS came to be where it is today. Blake talks about the lessons he learned along the way and the people who have inspired or helped him make TOMS what it is today. Blake does a fantastic job of walking you through his story with passion and ease, the chapters are concise and make sense, and the pictures of key moments or from his journal of a specific moment help make the story come alive even more. I really enjoyed the basic story of TOMS, which is both inspiring and exciting all on its own, but really the most helpful part of the book is reading about the lessons he learned along the way, whether through happenstance, intentional choices or because of mistakes. Blake also gives advice and resources that can help you start your own something that matters, and thankfully his advice is not another self-help to becoming a millionaire, but rather practical advice for a balanced and passionate life and career. The advice comes in all sorts of stories or bullet points, it speaks to the still in college person just as much as the retired and re-evaluating things person. I was amazed at how easily the points are transferable and meaningful for everyone regardless of their position where they work currently or their stage in life. The advice Blake gives as he details his TOMS journey is not only entertaining to read because of his honesty and sense of humor, but it also strikes a chord because of the practicality and the fact that it appeals to your own desire to want to make a difference and be a part of something that matters. Throughout the book, I had this intense sense of appreciation for the perspective Blake has towards TOMS, business in general, and the way his goals for growing his business and what his goals are with TOMS (or how they have changed throughout the years). Start Something That Matters does a fantastic job of giving timelines and information that allow you to connect with the story even more from your (my) own perspective… I was able to connect the book’s timeline with my own timeline and story, all of which made it feel as though I had an even deeper connection. I was able to pinpoint in his timeline when I was first introduced to TOMS, when I first saw the video from their first shoe-drop (and when I posted it to myspace, before Facebook allowed that kind of sharing). I really enjoyed reading the stories of other people that were shared in the book of how excited they were to be a part of TOMS in their own way, and how they too are making a difference, but even more than that, I liked hearing Blake’s perspective and reactions to the stories. They all reminded me of how even for myself, a large part of my connection to TOMS is that I love the story and feel connected too. The book was the type of good, that I actually wrote in it, circled, underlined and dog-earred pages, and mulled over what I was reading the entire couple weeks it took me to read the book… Not only did I feel fully engaged in the book while I was reading it, but I have begun to think about people I want to buy copies for (because I want to keep my own, and I only have one to give away later). Start Something That Matters sticks with the “One for One” model that was originated with the shoes, migrated to eye-ware, and continues with this book, for every book bought, a new book will be given to a child in need. I cannot even begin to explain how much I appreciate the consistency and continuity that Blake is exhibiting with all of his ventures. In short, buy this book, read this book, absorb the message, and share it with others. You won’t be sorry. And then, the give away of the second book! 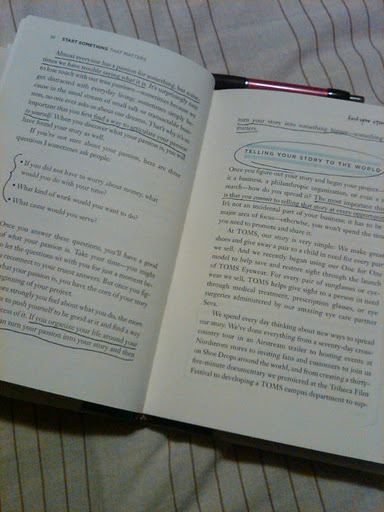 This entry was posted on November 28, 2011 by kpbback in Blake Mycoskie, Reading, TOMS.